This marinade is great to make for kids, who adore the flavours. It works well for all types of chicken pieces (wings, drumsticks, thighs), but it's a really simple way of delivering maximum flavour to a chicken breast. To make the marinade, whisk together the soy sauce, cider vinegar, sherry, garlic, ginger and honey. Check the balance between spice, sweet, sour and salt and adjust if necessary, keeping in mind that the flavours of the ginger, garlic and honey will mellow dramatically under the grill. Place a cube of chicken on a bamboo or metal skewer, then a spring onion, and so on. This is great fun for kids to do and gets them involved in what they're going to eat. Place the skewers in a shallow dish, then pour over the marinade, turning the skewers to make sure they are well coated in the marinade. Cover the dish tightly with cling film and marinate in the fridge for 1 to 6 hours. When you're ready to cook, heat your grill to its max setting. 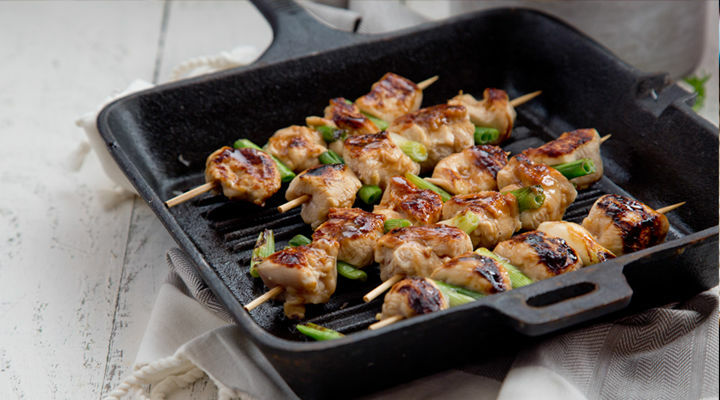 Place the skewers on a hot griddle pan and fire them under the grill. Cook for 6 minutes in total, turning them every 1 or 2 minutes and basting them with the yakitori sauce every time you turn them. Transfer the skewers to a serving platter and keep warm. Place the pan juices and any remaining marinade in a small saucepan with the brown sugar and a splash of water if necessary. Reduce until the sauce is silky and sticky but still light in colour. Check the seasoning, then strain the sauce through a fine mesh sieve and pour it over the skewers.